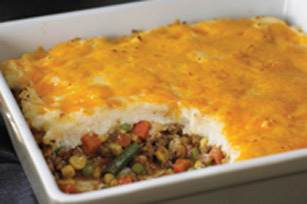 Shepherd's pie is a perfect comfort food. This one can be on the table in 30 minutes! 1. PREHEAT oven to 375ºF. Brown meat in large skillet. Drain. 2. MIX potatoes, cream cheese, 1/2 cup of the shredded cheese and the garlic until well blended. 3. STIR vegetables and gravy into meat. 4. SPOON into 9-inch square baking dish. 5. COVER with potato mixture. Don’t worry about it being perfectly even; the more rustic it looks, the better. 6. SPRINKLE with remaining 1/2 cup shredded cheese. Bake for 20 min. or until heated through. Makes 4 servings. Get more delicious casserole recipes here.